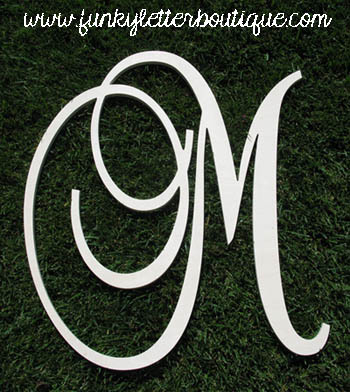 Fancy unfinished unpainted wooden monogram letter in 25" size. All of my letters are of the highest quality birch wood and 1/2" thick which makes them extra sturdy. Most of the other sellers only use 1/4" (or thinner) mdf which can be extremely breakable. No point in being cheap when you can get your letters done right the first time around. Price is for one 25" Letter. Please see font list for what the shape of your letter will look like. (disregard the times font on bottom that is for the fancy monogram set) In message section please list letter requested. Be sure to add shipping insurance to your order for this item! !